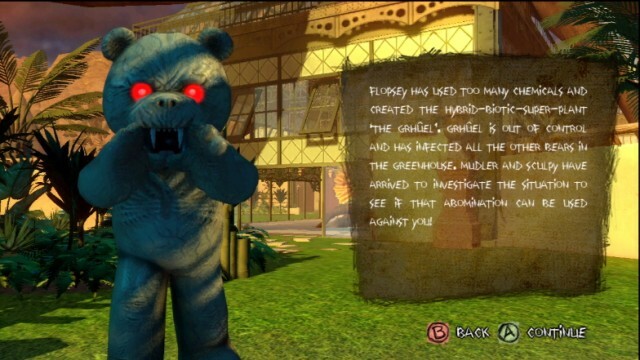 Naughty Bear: Panic in Paradise was developed by Behaviour Interactive and published by 505 Games. It was released on October 10, 2012 for 1200 MSP. A copy was provided for review purposes. 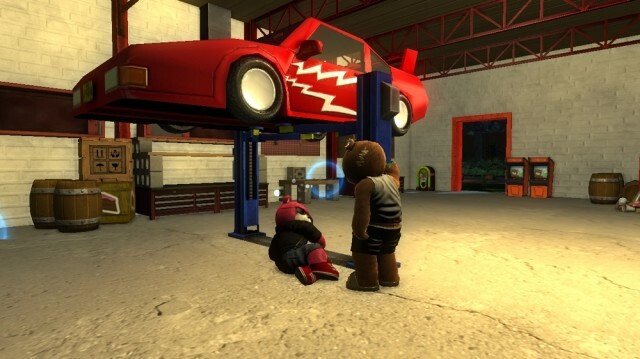 Naughty Bear was originally released as a retail game back in 2010. The game was heavily criticized by most, so we were more than surprised to see a sequel in the works and a downloadable one to boot. However it would be unfair to judge Panic in Paradise based on it’s predecessor so let’s wipe the slate clean and start with an open mind. 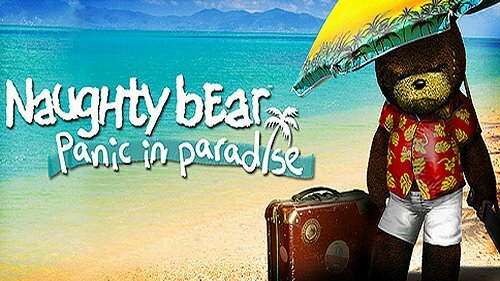 The premise for Naughty Bear: Panic in Paradise is that all the teddy bears went on a holiday to Paradise Island but didn’t invite Naughty Bear. Probably because he’s naughty and also a psychotic murderer. It seems like a reasonable decision to us but Naughty Bear is not a happy chappy. He decides to follow the party bus to the island anyway creating a hit-list of bears to punish along the way. Gameplay revolves around being tasked with the “punishment” of a particular bear and players can choose which bear to kill next from a menu screen, though some of the bears are not unlocked until you “defluff” a certain number of bears beforehand. 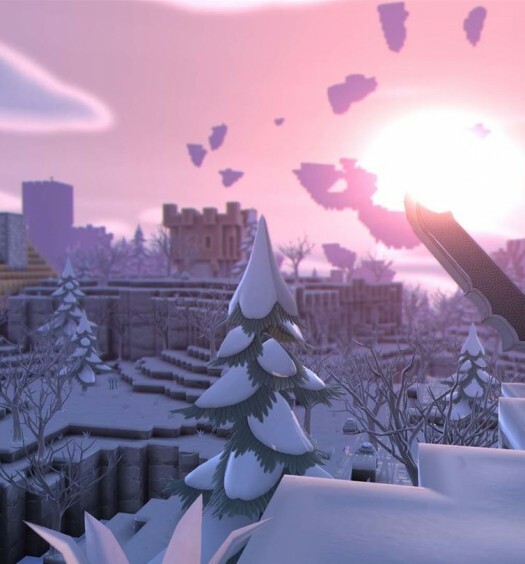 The assassination then takes place in one of the various maps within the game and once you’re in you are free to play out the level as you please, leaving at any time to bank your score. Fun gameplay – Punishing each bear is simply good fun and there are plenty of ways to do so, from drowning or barbequing them to some more outlandish modus operandi which we won’t spoil here. The method which you must use to defluff the main target in each round is determined for you, but it’s kept varied so the game stays interesting. For example in the earlier rounds you just need to kill the target with a specific weapon but as the game progresses you may need to have the target kill themselves, be killed by another bear in the round, or be killed on a specific stationary object somewhere on the map. This takes some ingenious planning on your part and is a highly enjoyable experience once it all plays out to a satisfying conclusion. Whilst the main target must be killed in a specific manner to progress the game, you may kill as many of the other bears in the map as you want, however you want. Players may steal the clothes off other bears and kill them with the many handheld weapons to find, and this in turn unlocks them for purchase in the store. Your performance in each round is then rated based on how naughty you were and these scores are posted to some well integrated leaderboards. Naughty points can be earned for each murder but also for trapping bears, scaring bears and generally smashing the area up and causing havoc. There is also a neat RPG system allowing you to level-up Naughty Bear’s stats giving him greater health and stamina so he can take on some of the bigger bears in the game. Lots of content – With 36 members on the hit list, representing essentially 36 levels in the game, Naughty Bear: Panic in Paradise is great value for money. Depending on your main objective, and whether you want to complete all the optional goals too, each hit can take around 20-30 minutes to complete. That’s some serious about of gameplay hours for a downloadable title, without even factoring in any replays. Each level is also played across 11 different maps so while you will see each a couple of times, it’s not often enough to become repetitive. There are also plenty of costumes and weapons to unlock and master to keep you going back. High replay value – Completing each hit is relatively straight forward and the easiest way to progress initially seems like stealthily stealing a bears clothes, sneaking up on your target, then legging it out of the arena to bank your score. Of course that won’t get you very far on the leaderboards. Players are rewarded with more “naughty points” for using a variety of killing methods, frightening the other bears to the point of suicide, or even taking a bear out in front of witnesses rather than safely in the bushes. Also as you unlock new costumes, those with a greater “insanity” level will cause the other bears to become more panicked and really racking up your score. 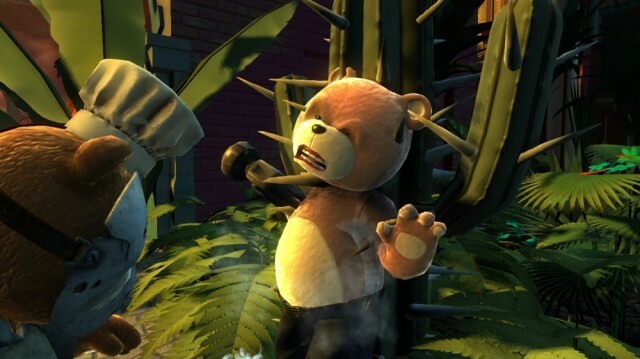 Slightly uncomfortable – The humor in Naughty Bear: Panic in Paradise is very, very, black and whether you find it amusing really depends on whether you find torturing cuddly toys funny. It’s only a game and most gamers have seen worse but there were a few moments watching bears vomit with fear or cowering at your sight just before you bludgeon them to death that feels a bit sick. Whilst there’s no blood, guts or bad language in Naughty Bear: Panic in Paradise, it’s maybe worth checking out yourself before passing the controls to a youngster. Cloudy objectives – Often the method of killing a target is very specific and you are not always advised of the full specifics of the mission until the level has loaded. We had a few instances of starting a round only to find out that Naughty was wearing the wrong clothes or carrying the wrong weapon. It’s also not always clear which weapon is which since you are given no indication of what you are holding unless you bought it in the shop prior to starting the round. This is especially a problem with the more fantastical weapons, for instance what does a “Rod of Justice” look like? A few bugs – Towards the end of the game we suffered a few game freezes. Nothing game breaking and not in the same place each time, but it’s not the kind of thing you like to see happen to your Xbox 360. Overall, Naughty Bear: Panic in Paradise may not be the greatest game and it’s unlikely to win anyone’s GotY, but in all honesty we had a lot of fun playing it. The gameplay is entertaining and addictive and there’s plenty of content to warrant the 1200 MSP price tag. There are a few negatives though, that stop us recommending a blind purchase and gameplay could become repetitive for those who don’t care for high scores. We do recommend you give the free trial a download however and you may just have enough fun to overlook the flaws.